Do you need a business bank account, but you don’t know who offers the features you want and the convenience you need? There are so many options for business banking these days that it’s difficult to discern which one’s right for your company. As a supplement to your own research, my team and I invested many hours poring over the details of the best banks for business. Our goal is to provide you with the information you need to choose the best fit for you. In this Chase business banking review, we’ll go over the pros and cons, pricing, features, customer reviews and more. Read on to find out if they’re a good choice for you! I’ll give Chase a score of 4.0/5. I appreciate their great website and apps, and their easy accessibility to a local branch is a big plus as well. Ready to get started with Chase? Need to review our guide to the top business banks? Simply use the buttons below and you’re on your way! With 16,000 ATMs and more than 5,000 branches around the country, it’s easy to find a Chase banking center. Chase’s mobile apps are user-friendly. Customer reviews for their mobile banking are overwhelmingly positive, which isn’t true for all of their major competitors. Additionally, they’re often on the leading edge of technological advancements in the banking industry. Their 3 levels of business checking packages are targeted to suit small, medium and large businesses. No matter what your needs are, Chase has a checking account for you. If you add a business credit card, you get access to some great rewards including cash back, travel rewards and much more. Their top-tier Platinum Business checking account is expensive, with $95 per month in fees, and it still has a 500 transaction limit. With savings rates that range from 0.05-0.15%, their interest rates aren’t the absolute lowest in the business, but they’re still pretty low. What It Includes: 200 monthly transactions, a monthly fee of $12 when enrolled in Paperless Statements or $15 for paper statements, waived with $1,500 minimum balance, $7,500 monthly cash deposits. Who It’s Right For: Small businesses or sole proprietorships that don’t process a ton of transactions will enjoy the low fees and reasonable limits of the Total package. What It Includes: 350 monthly transactions, $20 monthly fee waived with $50,000 average balance, $20,000 monthly cash deposits, 2 domestic wires per month. Who It’s Right For: Growing companies with more demanding banking needs will do well with the Performance account. What It Includes: 500 monthly transactions, $95 monthly fee waived with $100,000 average balance, $25,000 monthly cash deposits, unlimited electronic deposits and incoming wires, 4 outgoing wires per month, Chase Platinum Business Service customer support system which grants you priority service. Who It’s Right For: Large companies with complex banking requirements, who either don’t mind paying the $95 fee or have enough cash to maintain the $100,000 average balance to waive it. Unless you’re running a big business, I think the Performance package looks good. Most companies don’t need to send wires or pay up for premium support in the Platinum package, and the Total package is just a bit too limiting for my tastes. However, you know your business best, so be sure to choose which one suits you best. Finally, keep in mind that their business credit cards have some great perks like cash back and travel rewards. It can be hard to find honest customer reviews for business banking institutions, but one place where I consistently turn to is reviews of bank apps. Chase does quite well in this area, as they have excellent average ratings on both Google Play and iTunes. It seems that many of their business customers enjoy the convenience afforded by Chase’s many physical branch locations, as well as how easy it is to manage multiple accounts. Conclusion: I’ll be honest, it’s rare to see such positive customer feedback for a major financial institution. I will say that I found some complaints about their service department, but that’s bound to happen anytime you’re dealing with a company this large (some unsatisfied customers always fall through the cracks). On the whole, customer feedback is quite good for Chase. Considering how much time I’ve spent studying the best banks for business, I’ve figured out that some of them are simply better offers than others. Of course, the goal is still to discern which one has the best combination of features and convenience for you. Chase is a good bank for business because of their easy accessibility and technological advancements. Still, it’s always smart to keep an eye on the competition, so let’s also look at my personal favorite, Spark Business by Capital One. Pricing: Spark Business does not charge any fees, and they don’t have minimum balances on their business bank accounts. Features: Chase has more than 5,000 branches nationwide, whereas Spark Business is a digital product that doesn’t have physical branch locations. 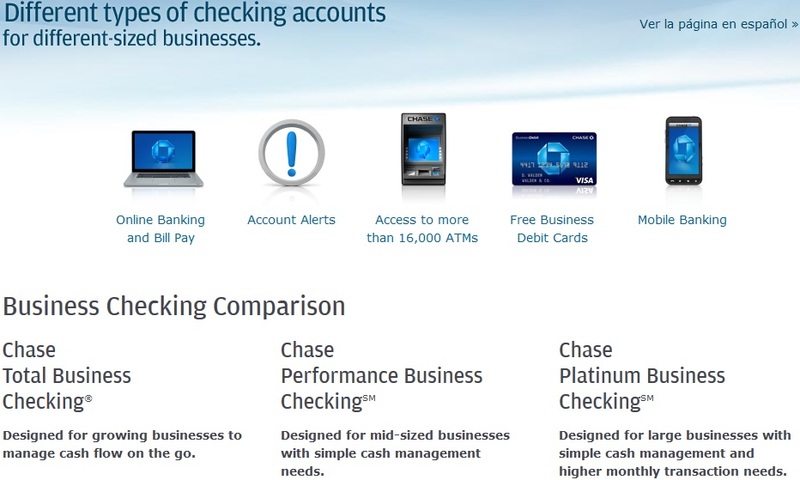 However, Spark Business does give you access to 40,000+ ATMs, while Chase has 16,000. As for the savings accounts, Spark Business gives you a 0.40-1.00% APY which is far better than Chase’s 0.05-0.15%. Customer Support: Considering the size and scope of these banks, customer service by default will not lead to 100% of their customers being satisfied. In my personal experience, both Chase and Spark Business are easy to get ahold of and have friendly, knowledgeable reps. Just know that not everyone has this same experience. Experience: Capital One is the 8th biggest American financial institution, having opened back in 1988. On the other hand, Chase is the largest bank in the US, in business since 1877. You can’t open an account online, which means you’ll have to go to the nearest Chase location. While that’s a bit of a letdown, we’re sure it doesn’t take too long in person. And again, with more than 5,000 branches there’s bound to be one nearby. What Perks Come with Checking Accounts? Their Performance and Platinum accounts include wire transfers, and Platinum also includes their preferred customer service program. You can make deposits through their Chase Mobile app, at a branch near you or at one of their many ATM locations.